The Satake N Sifter is an exceptionally versatile, compact machine of high capacity which can be used for either general purpose sifting or flour redressing. This perfectly balanced machine is easy to install, occupies little space and has many of the features of the larger Plansifter. 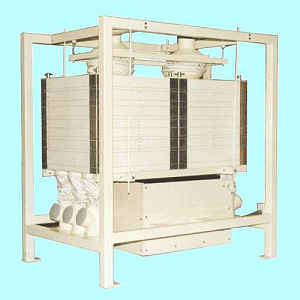 The N Sifter is widely used throughout the world on all types of granular floury stocks. The sifter consists of two independent nests of square sieves, capable of simultaneously handling two separate materials. The sieve nests are clamped to a ridged base, supported by canes from the main frame. Each nest supplies two, three or four separations, and spacer elements provide extra ceiling height above the covers, if required. Up to seven sieves per nest can be used. Each sieve comprises of a cover mounted on a removable loose clothing frame which is cleaned by free moving cleaners.